As a publisher of beautiful children’s books, Crickhollow Books is committed to quality over quantity. Crickhollow Books and Crispin Books are intertwined imprints of their indie book publishing house that is based in Milwaukee, Wisconsin. They are also known for their amazing catalog of picture books that shine the spotlight on topics with social or environmental impact. With titles like Doyli to the Rescue, Tony and His Elephants, and Tortuga Squad, they have much to be proud of! Crickhollow also offers a lot of middle-grade fiction focused on good values and a variety of books for adults, including books for writers on how to write well and get published. Meet Emily, a girl who is active in a youth conservation program to save rainforest animals in western Costa Rica. She helps care for an orphaned baby sloth at an animal sanctuary and participates in other activities from dramatic presentations and clean-up efforts to the sponsorship of rope bridges installed to help squirrel monkeys cross busy roads near her small town. The story highlights the impact young people can have on protecting local wild animals and preserving natural habitats. 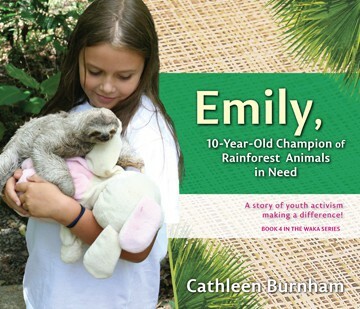 Emily: 10-Year-Old Champion of Rainforest Animals in Need is a photodocumentary book by journalist and writer Cathleen Burnham, the fourth in her WAKA (World Association of Kids and Animals) series of books featuring kids involved in wild animal rescue efforts around the globe, praised by School Library Journal as “books about compassionate efforts by children that inspire readers to take positive action … a wonderful addition to most collections”. 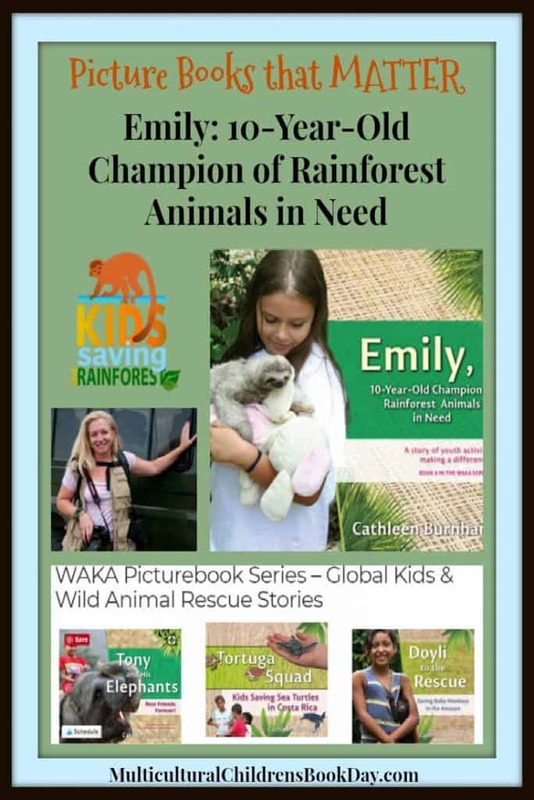 This book introduces Emily, a ten-year-old girl active in a youth conservation program to save rainforest animals in western Costa Rica called Kids Saving The Rainforest (KSTR). Emily helps care for an orphaned baby sloth at a local animal sanctuary and participates in other activities from dramatic skits for tourists and clean-up sweeps to the sponsorship of rope bridges to help squirrel monkeys cross busy roads near her small town. The story highlights the impact young people can have on protecting local wild animals and preserving natural habitats. The conservation message is clear and is skillfully blended into the glimpse of everyday life of active kids and their families who are involved in small-scale, grassroots animal-rescue efforts. This is Book 4 in the WAKA series of books featuring kids involved in wild animal rescue projects around the world. Cathleen Burnham is also the author of the highly acclaimed books, Doyli to the Rescue, Tony and His Elephants, and Tortuga Squad. For the past fifteen years, Cathleen has traveled the globe, bringing back stories of the world’s remote cultures, from the Hodzabe People of Tanzania to the hill tribes of Thailand to the peoples of the Amazon. Her work in all areas of television production has included stints at NBC, PBS, and Fox. For the past eighteen years, she’s also been a Wildlife Rehabilitator under New York state D.E.C. board member Barbara Hollands’ license. 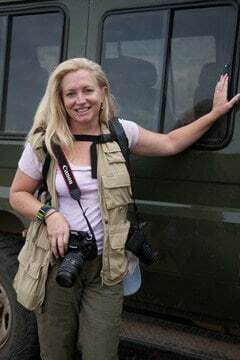 This experience has given her an insight into animal behavior that’s served her well in both her writing and photography of wildlife across the world. Cathleen is drawn to journalism because she believes in its paramount importance in a society and because she loves to learn the stories behind the planet’s people, animals, and places. 1. What inspired you to choose this story? Cathleen: The ingenious, simple, and inexpensive solution of monkey bridges — that a child came up with! The ropes strung across busy highways saved so many endangered monkeys’ lives. No big organization needed. No big studies launched. Just some kids thinking up an idea and putting it into action. I thought this story needed to be told to as wide an audience as possible. In Costa Rica, as humans expand their towns into animals’ territory, many endangered animals are threatened by cars, or by eating foods given to them by tourists that make them sick. I also loved that Emily approached animal protection from several angles: creatively writing a play to educate tourists, helping at a wildlife rehabilitation center, and taking a few minutes now and then to help with clean-up sweeps with other kids. I want the message of these books to be that kids can do a few things in their free time to help local wildlife and make a positive impact. Emily was a great, real-life role model of ways kids can help. I hope Emily: Champion of Rainforest Animals sparks excitement for kids and gets them thinking about how they can help the environment, wherever they live. 2. In your own words, tell us what the book is about? Cathleen: Emily: Champion of Rainforest Animals tells about a real-life 10-year-old girl active in programs to save rainforest animals in western Costa Rica. She helps care for an orphaned baby sloth at an animal sanctuary and participates in other activities from dramatic presentations and clean-up efforts to the sponsorship of rope bridges to help squirrel monkeys cross busy roads near her small town. The story highlights the impact young people can have on protecting local wild animals and preserving natural habitats. This is Book 4 in the WAKA series of books featuring kids involved in wild animal rescue projects around the world. 3. If you were to let parents, teachers, and librarians know ONE THING about Emily: 10-Year-Old Champion of Rainforest, what would that one thing be? Cathleen: Kids can have a real impact on the world around them! Kids are not just the next generations of caretakers of our planet, they also can do things now to make a difference. The WAKA series (4 books so far) are stories of kid power, stories about real kids to inspire kids and parent to empathize with the wild world around them, to see how we are all connected on this planet, and to find ways to make a difference. 4. If you were to give any advice to the those who dream of writing and publishing a book, what advice would you give? Cathleen: Write often! Even if you feel your writing is terrible at first. It WILL get better and eventually get to be excellent if you just keep writing. Also, don’t limit your story trying to imitate what everyone else has already written or worrying about who will publish it. That can get in the way of your imagination. Just tell the story that spills out of your imagination, and then make it the best it can be. 5. What about Emily: 10-Year-Old Champion of Rainforest do you like best? Cathleen: I like all of the things that happen in the story, like the harrowing story of the baby sloth falling out of the tree, or the juvenile squirrel monkey saving the rest of its monkey troupe. But my favorite is the sloth walk — Emily taking the baby sloth for walks in the forest to help it learn about its environment. I loved that a kid got to do this, to hold a baby sloth and give it tons of love. 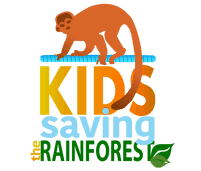 Kids Saving The Rainforest, featured in the Emily picture book, is such a remarkable organization. It was started in Costa Rica by a group of kids and adults who had no qualifications except loving wildlife and wanting to protect it. I was so lucky to get to visit them, and I even got to take the baby sloth on a sloth walk myself. The sloth’s fur was very coarse. You really did have to hold a stuffed animal against your body, because those claws are sharp and they hurt when they cling to you – we humans don’t have thick, coarse fur to protect us. The little sloth moved very slowly, and it was adorable the way it would slooooowly turn its head to look at me with big, soft eyes. It was one of my favorite experiences. Connect with Cathleen and Crickhollow Books via their website. I know! All of Cathleen’s books showcase kids that just blow our minds with their passion and innovation!